Conanicut Island, which divides Narragansett Bay into its East and West passages, is nine miles long and a mile wide. The island is named for Conanicus, Narragansett sachem and friend of Roger Williams. Artifacts have been found indicating Native Americans used the island 5,000 years ago and probably earlier. With new steam ferry services available in the early 1870s, the island gained in popularity as a summer resort. A steam ferry between Jamestown and Newport began running in 1873, replacing a small sailing vessel used mostly by farmers. Steamship travel also ran between Wickford—the terminus of a railroad line from New York City—and Newport. Bridges from Conanicut Island to Saunderstown and Newport weren’t completed until 1940 and 1969, respectively. For some years, the Newport and Wickford Railroad privately maintained a simple light and foghorn at the northern tip of the island. 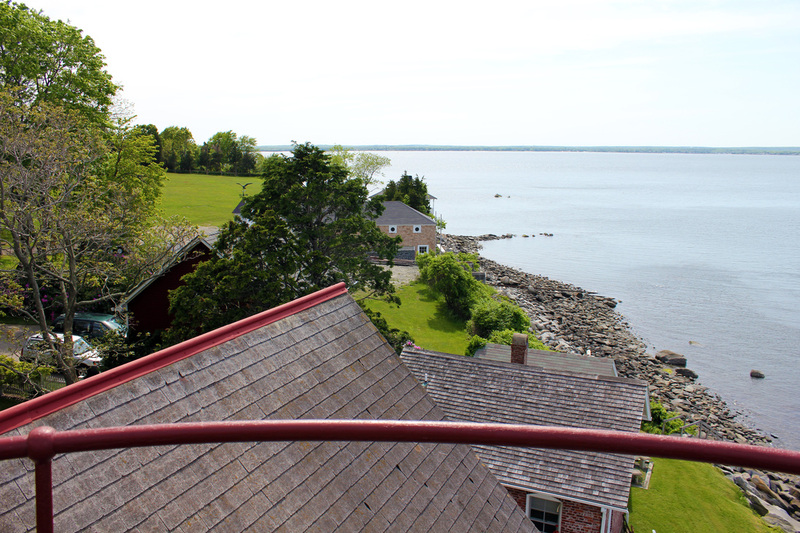 The steamship interests appear to have played a major role in the Lighthouse Board’s decision to build a lighthouse at Conanicut Island’s northern tip, primarily as a guide for vessels heading south on their way to Newport or the Atlantic Ocean. Congress appropriated $18,000 in July 1884. The contractor in charge of construction was Linas Seeley, and the lighthouse was finished by early spring of 1886 and first lighted on April 1. A fixed red light was exhibited from a fifth-order Fresnel lens with a focal plane 47 feet above the bay. The lighthouse took the form of a handsome two-story, wood-frame Gothic Revival house with six rooms, with a square tower attached to the northeast corner. The building was very similar to the lighthouse built four years earlier in Wickford Harbor. An air siren replaced the original fog bell in 1900. The continuous blast produced in times of fog by the new equipment most likely wasn’t appreciated by the neighbors. A brick oil house was built in 1901, and a new brick building was added in 1907 to house the equipment for a new steam-driven fog signal. The barn, oil house, and fog signal building all survive today. The first keeper was Rhode Island native Horace Arnold, veteran of a dozen years at Conimicut Light to the north. A newspaper article about Arnold on the occasion of his death said he was born on Prudence Island and came from a family of lightkeepers. He served in the Civil War as a member of Company G, Fourth Rhode Island Infantry. After surviving three years in the war, Arnold nearly lost his life in a shipwreck on the Potomac River on his way home. The excitements of former days had passed and the captain found in his later years a haven where he could rest as well as do the work of his position, and where he did much to add to the pleasure of his home life by cultivating the garden about the house and making it agreeable for his many friends who frequently called upon him. Arnold once made a risky walk out onto the ice from the lighthouse to assist the passengers of a stranded vessel. The boat's skipper presented the keeper with a captain's chair for his considerable efforts, and the chair remained a treasured possession of the Arnold family for many years. Arnold remained at the light station until his death from pneumonia at the age of 74 in February 1914. 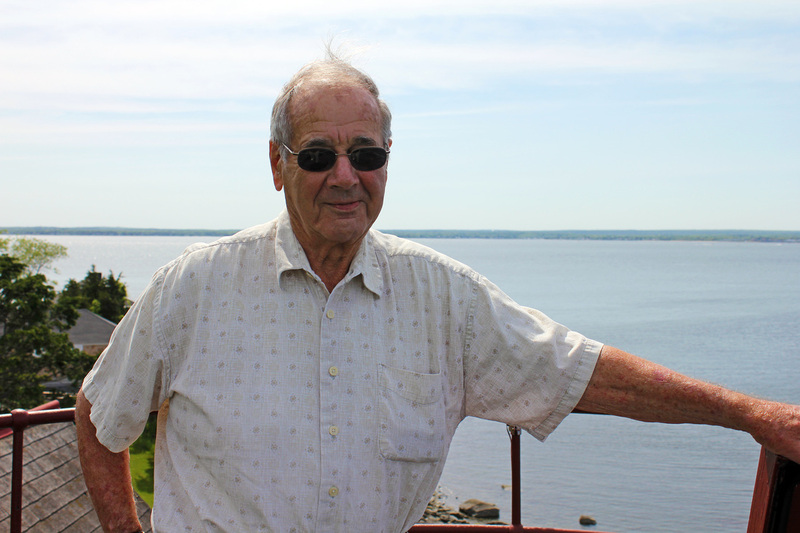 The lighthouse's second and final keeper was Elmer V. Newton. Newton stayed in charge until 1932, when it was decided that decreased shipping traffic meant money could be saved by transferring the navigational light to an unattended 50-foot steel skeleton tower about 55 feet east of the lighthouse. 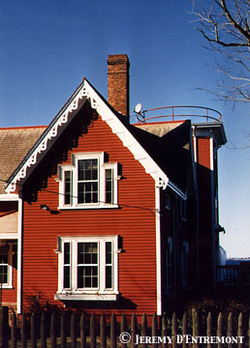 The lighthouse, with the lantern room removed, was sold at auction for $2,785. The automatic light remained in use until April 21, 1982. The skeleton tower was quickly dismantled and sold for scrap. The lighthouse was white with dark trim during its active years. Today it's painted red and white, and still retains its gingerbread trim. Despite the addition of a small sunroom, the building remains well cared for and largely unchanged. Scenes in the 2011 movie Moonrise Kingdom were shot at the lighthouse and other locations around Jamestown. In its location on North Bay View Drive, it's difficult to get a good view of the entire lighthouse from the road due to the surrounding trees. Views are available from some sightseeing cruises in the area. 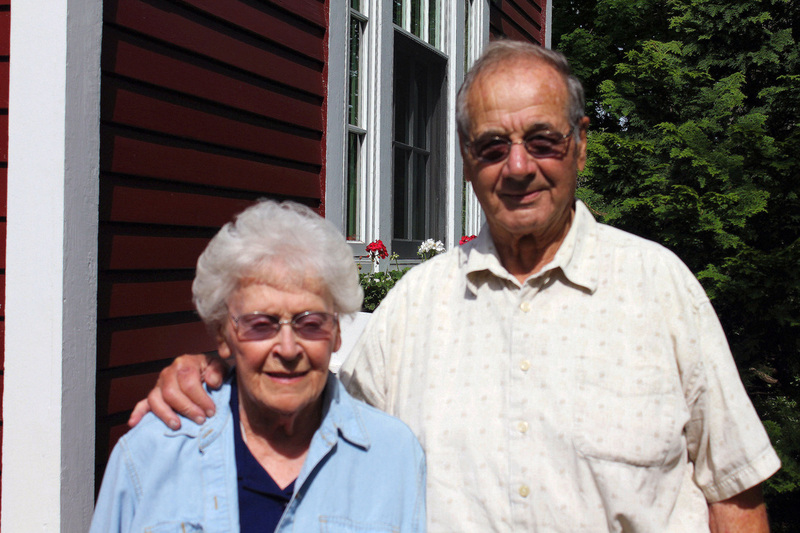 Helene and Ras Lischio, owners and residents of the Conanicut Lighthouse, during a visit in May 2012. Ras Lischio at the top of the old lighthouse tower.